M.B.B.S. 1993 R.N.T. Medical College, Udaipur, Rajasthan. Carried out research on “role of laparoscopy in the diagnostic evaluation of abdominal ailments” from 1994-96. Research accepted for awarding the degree of M.S. by the university of Rajasthan. Role of laparoscopy in the diagnostic evaluation of ascites’.ASICON95.55th national conference of association of surgeons of India. Agenesis of gall bladder with primary choledocholithiasis’ WEZCON94 international college of surgeons, Indian section-west zone conference. Traumatic diaphragmatic hernia with the colo-pleural fistula’44annual conference of Indian association of cardiovascularthorasic surgeons. Delivered a lecture on “infective colitis” at advance instructional course session of ACRSICON2010 at Jaipur. Role of nifedipine in the management of fissure in ano’ACRSICON2010 Jaipur. Delivered a lecture on “ischiamic colitis” at basic instructional course session of ACRSI. Delivered a lecture on current management of fistula and conducted a panel discussion on stapled haemorhoidopexy in ISCP 2011. Delivered a lecture on miligan & morgan Hhaemorhoidectomy. Time to time organization of free medical camps and educational services for socially underdeveloped, poor, needy persons of society in interiors of state of Rajasthan, Haryana, Madhya Pradesh, Assam. In the capacity of joint organizing secretary& in charge of the scientific programme of ACRSICON 2010 held at Jaipur successfully organized the conference as well as a scientific feast which was appraised by everyone. Done approximately 15000 surgeries in last 15 years .As general surgeon wide variety of general surgical procedures starting from thyroid and neck region to breast surgeries to laparotomies,to hernia surgeries to ,urological,gynecological procedures. later on developed special interest in laparoscopic, anorectal surgeries and done large no. lap cholecystectomies, appendicectomies,,lap hernias, lap gynac surgeries complex fistula, open, closed haemorrhoidectomies, lateral sphincterotomies, stapled haemrrhoidopexies. Lap rectopexies. 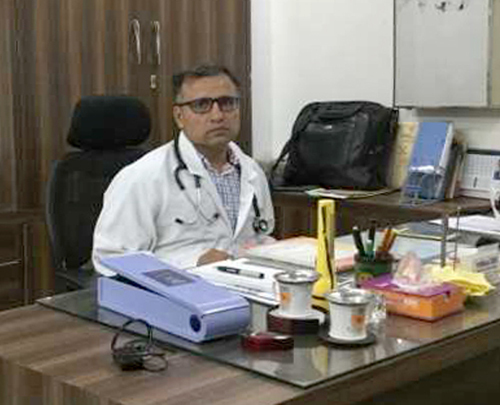 As director and majority stakeholder of Vaishali Hospital and surgical research centre(A 25 bedded multispeciality setup) since 1999 experience of administrative and management, marketing skills apart from handling all surgical cases.